A common summer scene involves kids squirting each other with the garden hose. Invariably, on a hot summer day some of the kids will take a drink from the hose. Weve all done it, whether as kids or adults. 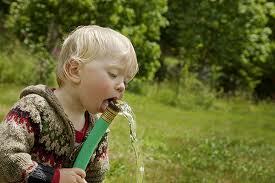 It turns out that drinking from a plastic hose may be hazardous to our health. Lab tests conducted on water left sitting for a day in 10 common brands of garden hoses revealed that 5 out of the 10 hoses had lead levels higher than the Environmental Protection Agency’s safe levels for drinking water. Despite a mandate for manufacturers to significantly reduce lead levels in hoses by July 31st, it appears there are still brands with excessive lead leaching into the water. You can avoid lead hoses entirely by purchasing hoses sold for boats or RVs, which don’t contain lead. Flush out any hose before using it, and avoid hoses with brass fittings, which also contain lead. Similarly, Consumer Reports tested 16 hoses. Four of the 16 were labelled “safe for drinking” and did, in fact, contain no more lead after water had stood in them for several hours than was found in water coming straight from the tap. The remaining hoses, some labelled unsafe for drinking and others not labelled, contained lead, the worst 10 to 100 times the EPA allowable for lead in drinking water (15 ppb). The issue is that many hoses are made of polyvinyl chloride, which uses lead as a stabilizer, and when water stands in the hose over a period of time water picks up lead from the hose materials. The moral: If you’re going to drink from a garden hose or use it in any other way that matters (e. g., watering your garden or filling your fish pond), buy a hose that’s intended to be safe for drinking water. It’s true there are garden hose filters that remove lead, but it makes a lot more sense to pay a few dollars more up front for a lead-free hose than to put lead in the water then filter it out.